Car camping is awesome. If you haven't tried it, I urge you to forget the retirement you've been racking up and blow your savings on a car big enough to lower the seats and stretch out in. Or if you already have such a car, make another use out of it - bed! 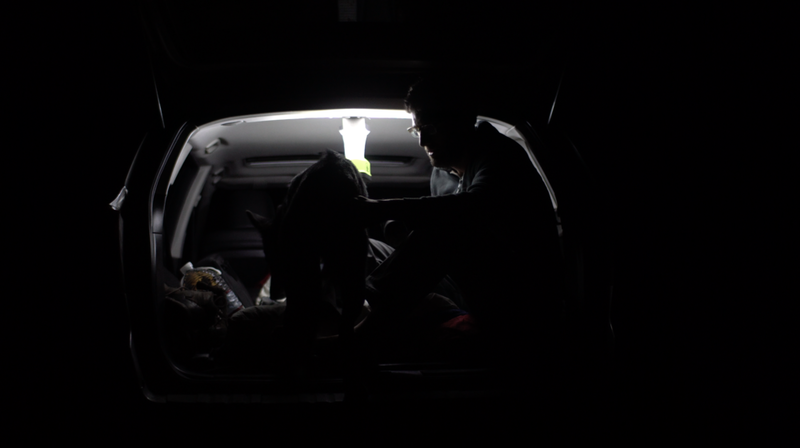 But for those skeptics, what would sleeping in your car look like? Mind you, this is my first time, so I don't have everything figured out (to the level of Advantures!). During the day I spread all of my gear out flat so I can access what I need to easily, and then I stuff it in the front seats and lay out the blankets at night. I also bought a solar/USB lantern along the way that has a handle that hooks in wonderfully to different things in my car. I can't find my Kindle these days, so this helps make reading (and cooking) possible. Before that I was turning on the door lights and praying that the battery wouldn't die, so I'd fire up the car every twenty minutes or so. Paranoia? When I get to a campsite at night (happens all too often, yay bad planning!) It's always a mystery what you wake up to. It's fun wiping the windows to find out. The best part is that when you get cold, just turn the car on and let the heat run for a bit. I'm actually stunned at how resilient six-month-old Denali is. Last night we slept in 30 degree weather in snowy Winthrop, and he was FINE. I assume the blanket below him and my body heat kept him that way, but I expected him to complain.